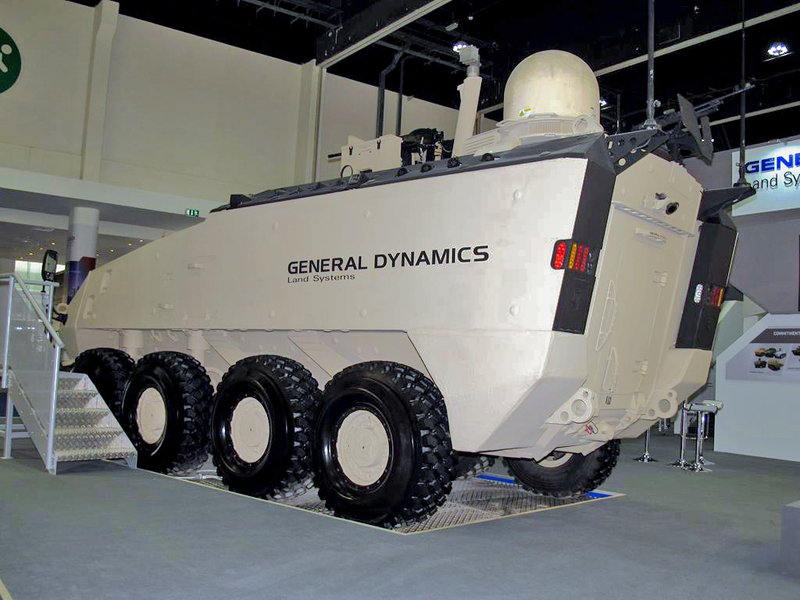 As usual, one of the main topics at IDEX was related to armoured vehicles. 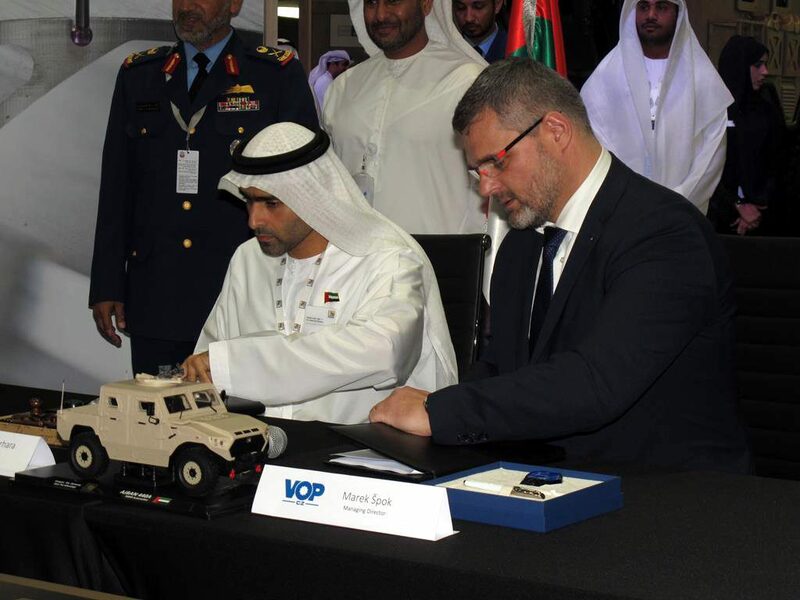 The UAE themselves, as well as numerous other countries in that geographical area, are looking for new platforms or for refurbishment programs of armoured platforms already in their inventories. On Day 1 a vehicle hidden under a white sheet in the Tawazun chalet was awaiting the VVIP procession attending the inauguration to be unveiled. When the vehicle appeared it was clear that the future editions of IDEX would see a lesser presence of 8×8 infantry fighting vehicles: the UAE had made their choice. 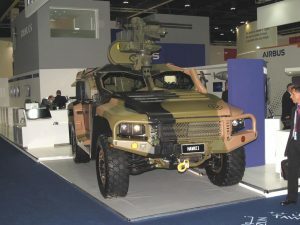 After having acquired as UOR an undisclosed number of Patria AMV chassis, to be fitted locally with weapon systems, to support operations in Yemen, the Emirates Army decided to go to Turkey for its future IFV: the hidden vehicle was a version of Otokar’s Arma 8×8 fitted with a BMP-3 turret, the latter having been for years one of the main requirements of the long-awaited contract. 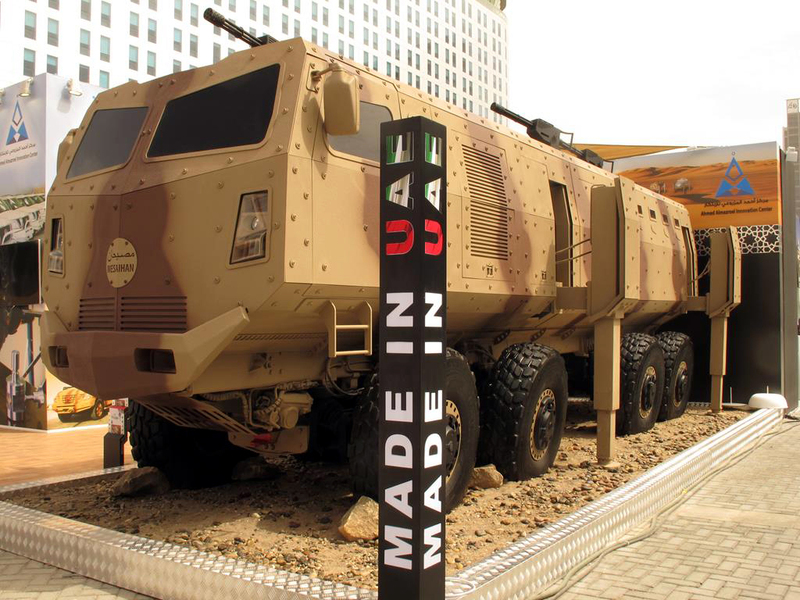 In 2016 Otokar had set up a local company, Otokar Land Systems, which now formed a joint venture with Tawazun Holding, the company being known as Al-Jasoor. 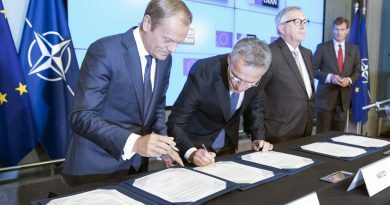 It is this company that earned the 625 million Euro contract that should cover the manufacturing of 400 vehicles, part of which in the armoured personnel carrier version. The chassis will be produced by Nimr Automotive, now a division of the Emirates Defence Industries Company (EDIC). The 8×8 was named Rabdan, and has a 28 tonne GVW; powered by a 600 hp it is fitted with two rear screws that ensure a 10 km/h speed in water, while maximum speed on road is 105 km/h. The IFV version can host the driver, the commander and gunner, and 10 dismounts, the vehicle being fully protected against ballistic and mine threats at Level 4+. 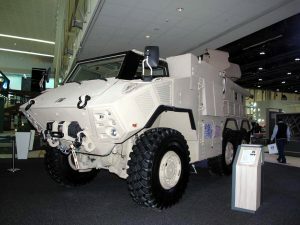 A vehicle that already saw action in Yemen was the Jais 4×4 exhibited by Nimr at the EDIC stand, which showed numerous impacts both on its opaque and transparent armour. 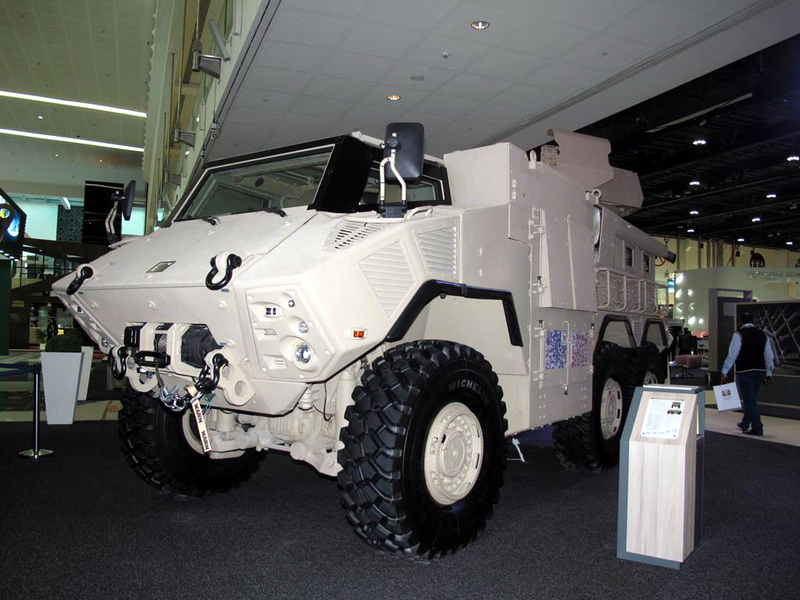 The “Nimr Saves Lives” motto will be soon applicable also to the 6×6 version of the vehicle, exhibited with a Turra 30 turret developed by Slovak EVPU. This 27-tonne vehicle is powered by a 600 hp engine and as its 4×4 brother features a Level 4 protection, both being derived from the South African RG35. Another first from NIMR was the Rapid Intervention Vehicle (RIV) that is aiming at the contract for the UAE Presidential Guard, in fact, the Emirates Special Forces. Its 300 hp engine is capable to speed up the 4-tonne RIV at 100 km/h in less than 11 seconds, maximum speed being 160 km/h. With a 1.5 tonne payload, it can carry up to four operators, a 12.7 mm machine gun or 40 mm AGL being installable on the roll bar, a 7.62 mm machine gun being available to the vehicle commander. With some considerable export successes in the EMEA area, Nimr Automotive decided to increase its footprint and is now looking at Eastern Europe: on Day 2 of the exhibition its CEO, Dr.
Fahad Saif Harhara, and the General Manager of VOP CZ, Marek Špok, signed an agreement that makes the Czech company the responsible for marketing, distribution, production and after-sales support in the Czech and Slovak republics, Poland and Hungary. 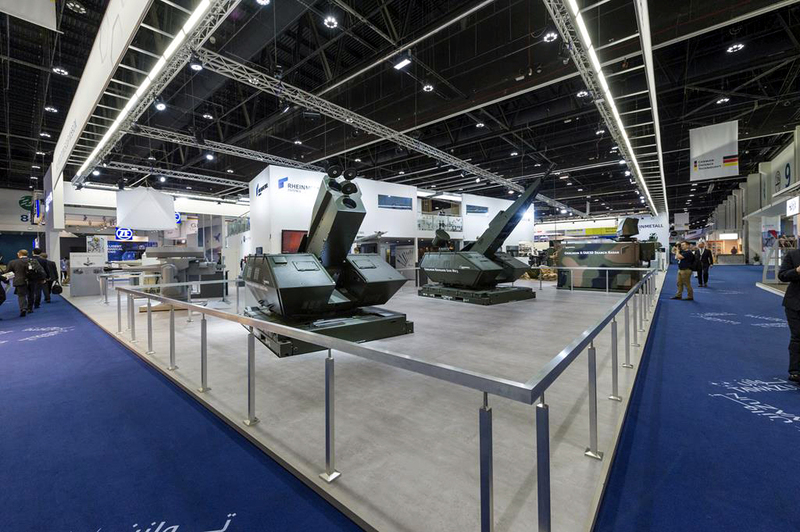 That said, the national market remains key to Nimr, the last day of the exhibition the UAE having announced the acquisition of 1,500 Jais in the 4×4 and 6×6 versions, over 150 Hafeet 630A artillery support vehicles and 115 Ajban 440 vehicles to be equipped with guided missile systems, the overall value of the contract remaining undisclosed. exhibited its LAV 700, the latest iteration of the US/Canadian vehicle originally derived from the Swiss Mowag Piranha. At 32 tonnes, with an 11 tonnes payload, the one on exhibition was a command post vehicle fitted with Kongsberg’s Protector Dual RCWS. GDLS states that the new version is already being delivered to an export customer, which might well be Saudi Arabia. 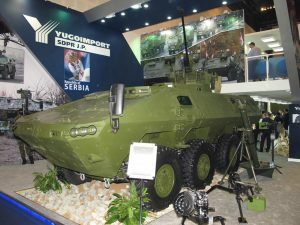 First appearance in real at IDEX for Yugoimport’s Lazar III, which was exhibited both in the IFV version, with a 30 mm turret, and in the APC version. 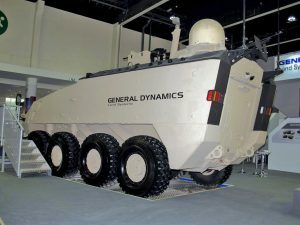 The 28-tonne vehicle is powered by a 500 hp Cummins engine and provides an all round Level 3 protection against ballistic and mine threats, with a Level 3+ on the frontal arc. Its is 4-6 tonne payload allows to further increase ballistic protection, to Level 4 overall and Level 5 on the frontal arc. 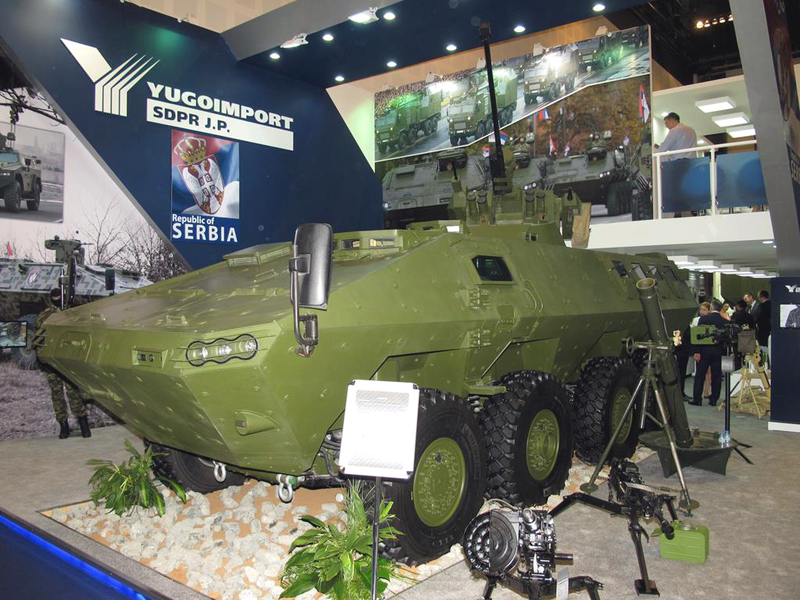 Yugoimport also unveiled three new systems, one of which being the Milosh 4×4, a 14 tonne GVW vehicle with all round Level 2 protection and Level 3 on the frontal arc. 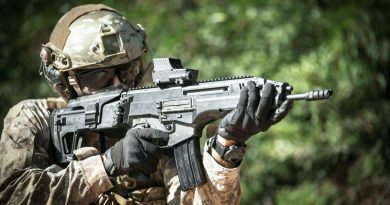 With a 9 m3 protected volume, it can host up to eight military in the APC version, five firing ports being available in the rear compartment to which soldiers access via the rear ramp. The Milosh is based on the Timoney and Texelis T700 driveline and is powered by a 300 hp Cummins ISB 300 diesel engine. Looking among the numerous vehicles exhibited in the outside area one of them is quite innovative, although modular vehicles are not new. The Abu Dhabi Ahmed Almazroei Innovation Center developed an 8×8 vehicle powered by a 554 hp (700 hp as option) which features an armoured cabin while the rear part is modular, modules being installed thanks to hydraulic jacks that can lift up to 5 tonne. Numerous modules are proposed, such as personnel carrier module, with side doors and rear ramp, fighting module, ambulance module, water tank module, etc. 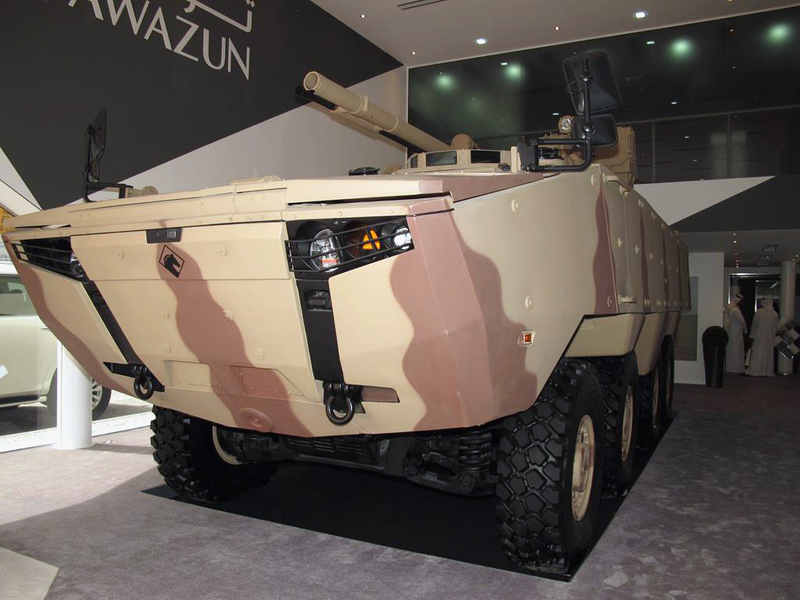 Numerous light armoured vehicles were exhibited at IDEX, two of them coming from quite a distance. 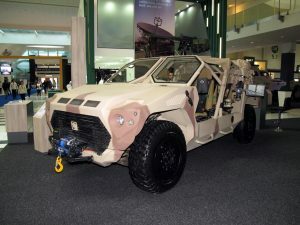 One was Thales Australia Hawkei, which is now under delivery to the Australian Army under the Land 121 Phase 4 contract. The 7.4-tonne vehicle provides a base Level 1 ballistic protection, which can be considerably increased thanks to the 3-tonne payload, a ceramic add-on kit providing Level 3 protection and being installed in the field by two men in less than 30 minutes. As for mine protection, the baseline vehicle can withstand the explosion of anti-tank mines thanks to its V-hull, the floating floor and mine blast seats provided by Plasan of Israel. The LTV comes from the Far East: Korea-based Kia exhibited for the first time in real its KM1 6.8 tonne 4x4which hosts up to eight soldiers. With a one tonne payload, it is powered by a 225 hp engine and has a cruising range of 560 km. No details on protection were provided, the vehicle being available in two wheelbase versions, 3.3 and 4.0 meters, weight data referring to the standard vehicle in the up-armoured reconnaissance version. 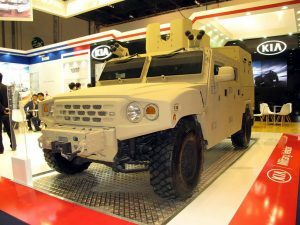 The vehicle is in service with the Korean Army, where it will be joined before year-end by the K806 and K808, the 6×6 and 8×8 armoured vehicles developed and manufactured by Hyundai Rotem, both companies being part of the Hyundai Motor Group. A few info out of the vehicles’ world. 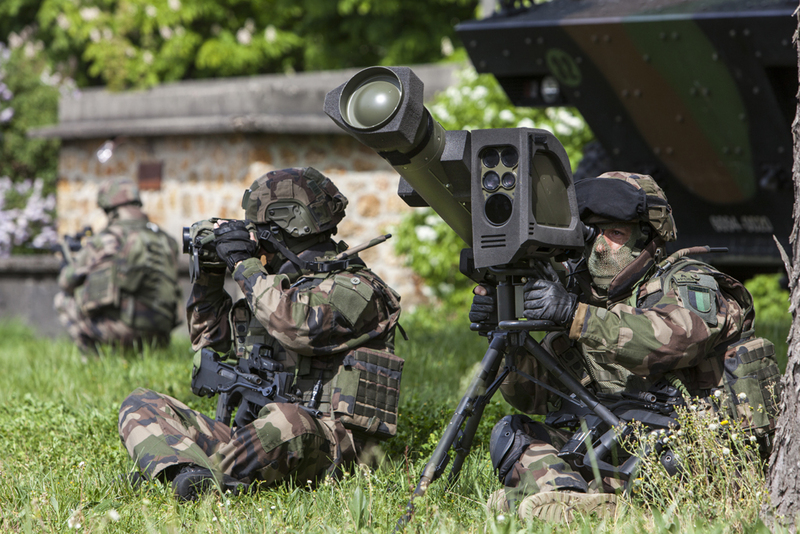 MBDA, the European missile company, started delivering the simulators for the MMP (Missile Moyenne Portée) to the French Army Infantry School at Draguignan. The first missiles will be delivered in July and instructor’s qualification firings will follow in September. First deployment is scheduled by year-end, the first two regiments to be deployed downrange with the new medium-range missile being both naval infantry, the 2nd and 21st RIMa. 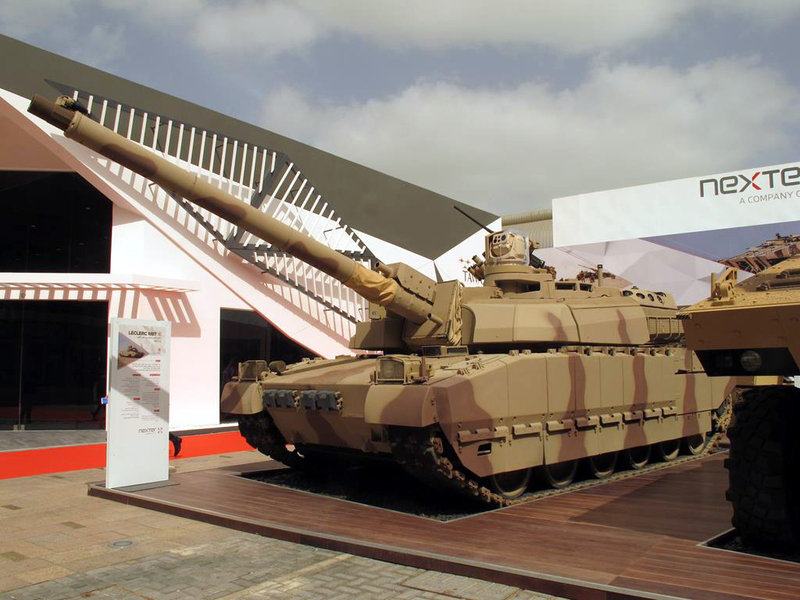 Coming to air defence, lessons learned from Yemen led Rheinmetall to develop an “umbrella” that could keep away the threats that higher tier systems, such as the Patriot, cannot deal with. Named “Below Patriot”, the concept deals with the threats that manage to overcome the “Patriot Fence”, such as aircraft and cruise missiles, defined as “odd leakers”, as well as those that are not taken into account by the Raytheon system, such as RAM, UAVs, etc. A development of the company Skynex introduced last June at Eurosatory, the Below Patriot concept is based on the Skymaster command and control system, the X-TAR X-band radar providing surveillance against short range incoming threats, the system being plugged in into the wider air surveillance net of the Patriot. Different effectors are being deployed to counter different threats; the typical suite includes two Revolver Guns Mk III, a High Energy Laser, installed on a Revolver Gun mount, and a Cheetah missile launcher. The latter missiles, which has cleared the feasibility study and which is being developed by Denel and Rheinmetall, is considered the optimum weapon to counter saturation attacks such as those carried out by 122 mm rockets and other MLRS-type systems thanks to its 60 cell vertical launcher. 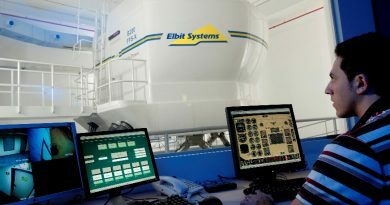 The system guidance allows directing several missiles at the same time against different targets, enabling simultaneous engagement up to 6km. The two 35 mm guns are the last ditch defence, using the new C-RAM round developed leveraging the AHEAD concept and including over 600 cylinders. The 10 kW laser is mostly used against drones, a threat that is increasing, the development of the swarm concept requiring a weapon capable to carry out multiple engagements in a very short time.